One of the important aspects of enjoying your holiday in a particular destination is to enjoy the Halal local food. Have you ever wondered: what kind of Halal food in Malaysia that you must try while having a vacation in this beautiful, Muslim friendly country? Well, you are about to get your answer as we will share with you 7 most scrumptious Halal Food in Malaysia that you must try – they are very appetizing and full of flavors! The next time you are heading to KL make sure you take note of this list of Halal food in Malaysia. They are very easy to find and you can have them for breakfast, lunch or dinner! A trip to Malaysia will not be considered complete if you do not try the national food of Malaysia – Nasi Lemak! It is a popular meal amongst the locals as they eat Nasi Lemak throughout the day. You can have it for breakfast, lunch, and even dinner! It is rice that is cooked with coconut milk and eaten together with several side dishes such as anchovy sambal, boiled egg, cucumber, and roasted peanuts. You must try it! Where to get it: You can either stop by at any Mamak restaurants to order Nasi Lemak or go to a specific Nasi Lemak restaurant such as the Nasi Lemak Antarabangsa or Village Park Restaurant. 2. Roti Canai – Crunchy on the outside and soft on the inside! Roti Canai is also one of the must-try Halal food in Malaysia. It is also known as Paratha Bread. 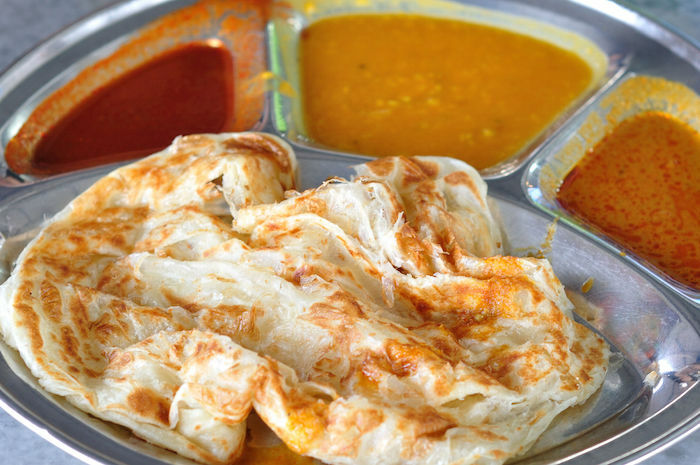 All races in Malaysia – Malay, Chinese, Indian, and others – enjoy eating Roti Canai! They have it at any time of the day. When you order Roti Canai, you can choose your preferred gravy. Usually, the locals eat it with curry, lentils gravy, and a little bit of sambal. Where to get it: Go to any Mamak restaurants and order a plate of Roti Canai. They are so tasty that you might come back for a second! Another must-try Halal food in Malaysia is Nasi Ayam. It is a fragrant rice that is eaten together with either steamed chicken, roasted chicken, or BBQ-flavored chicken. It also comes with several sides such as garlic sambal, chicken soup, slices of cucumber and lettuce, as well as soy sauce. 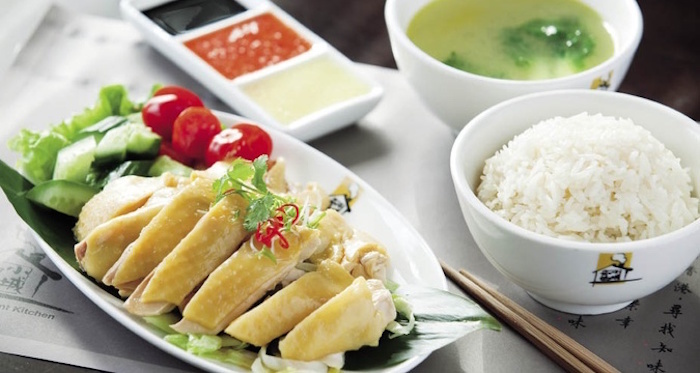 In several restaurants in KL, they also serve chicken rice together with vegetables like bean sprouts and bok choy (a type of Chinese cabbage). Where to get it: If you are strolling in the shopping malls, you can find Chicken Rice Shop, which is a Halal franchise restaurant. Or, you can also go to Nasi Ayam restaurants. Make sure you pick a Malay restaurant to ensure its Halal status. Whenever you are having lunch or dinner at a restaurant in Malaysia, instead of ordering a regular orange juice, try Ais Kacang! It makes a perfect companion to your main meal. It is a sweetened shaved ice. You can find all sorts of refreshing garnishes inside it such as black beans, jellies, ice creams, and corns. Where to get it: At almost any restaurants. Try to ask the waiter whether they have Ais Kacang on their menu. 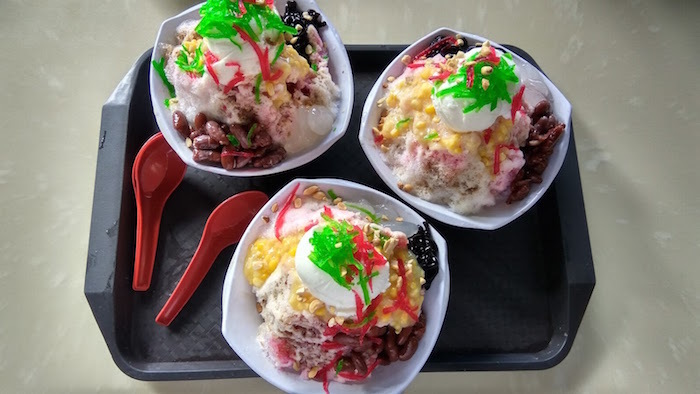 Cendol is also one of the scrumptious Halal food in Malaysia that you must try while having a Halal holiday in this country. 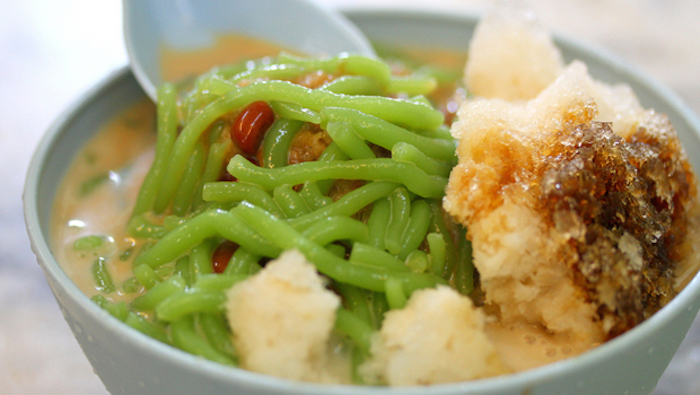 It is a local sweet dessert that consists of creamy coconut milk, brown sugar syrup, green jellies, and black beans. There are also several other versions of Cendol where they include glutinous rice, corns, vanilla ice creams, and even durian! They are absolutely delicious. Where to get it: At any local restaurants. Simply ask the waiter whether they have it on the menu. You can also stop by at any small stalls by the road. These small Cendol stalls are usually opened in the afternoon till late evening. 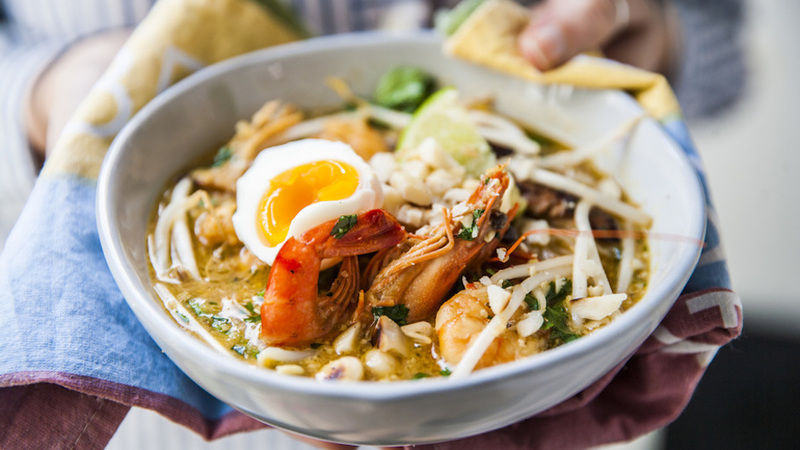 If you feel a little bit adventurous, you can also try Laksa. It is a local dish that is of Chinese origin. In a good bowl of Laksa, you will get rice noodles, slices of cucumbers, lettuce, boiled egg, and creamy fish broth or curry broth. A spoonful of Laksa will allow you to taste all sorts of flavors – spicy, sour, sweet, and salty. It is, indeed, a taste to remember! Do you know that Lonely Planet has listed Laksa as #2 must-try food for 2018? 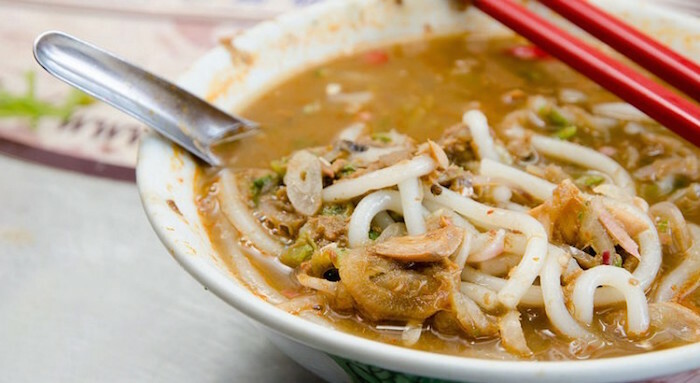 Where to get it: The locals usually eat Laksa in the evening. You can stop by at any Malay restaurants or go to a franchise restaurant like Old Town White Coffee, Madam Kwan’s or Sepiring Restaurant to get your dose of laksa! 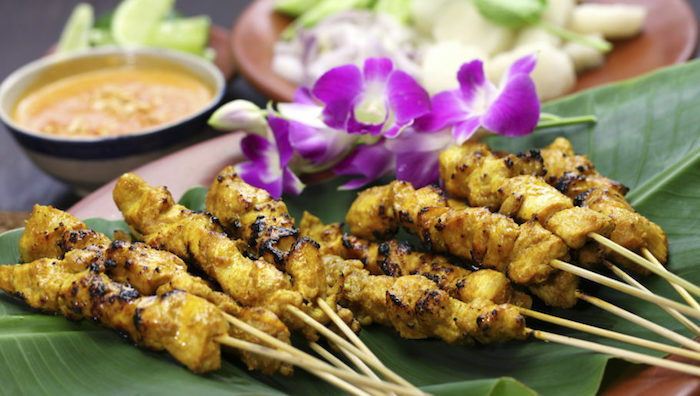 If you are feeling hungry at night, step out of your hotel and start looking for chicken satay (grilled chicken skewers). It is a tasty appetizer, very much loved by the Malaysians. What makes chicken satay unique and tasty is its marinade, the correct grilling style, and the side dishes – peanut sauce! The locals usually eat it at night while hanging out with their family and friends to enjoy the cool night breeze. Besides chicken, you can also choose fish, lamb, beef, and even rabbit meat! Where to get it: When looking for Malaysian grilled satay, you can check out any small stalls by the roadside. You know that they are selling satay when you see the smoke! Muslim foodies will definitely enjoy these 7 Halal foods in Malaysia! These 7 scrumptious Halal food in Malaysia are some of the must-try dishes for Muslim travellers who are having a vacation in Malaysia. They are full of flavors and they look good too! Since Malaysia is a Muslim country, you can easily find them at any Halal restaurants (mainly Malay or franchise restaurants). Give it a try and see how these delicious foods make an interesting part of your holiday experience!